When I stood on this starting line in Duluth Minnesota, preparing for my 3rd marathon, 4th attempted, I was confident. I was going to go out in 6:20-6:15 and see what happens. In my mind I felt like there was a possibility I could do it but I also knew it was going to be hard. Visualizing the finish [thanks to Jasyoga], crossing the line in 2:44:59, gave me the same feelings I had breaking the tape at my debut marathon. Two totally different outcomes on paper, but success is all relative. It's a matter of keeping things in context and learning to ride the wave. When I crossed the line in 2:48:45 a part of me wished I could have held on to run sub 2:45, but the other part of me knew that this was progress. This 2:48:45 was a comeback in the context of where I came from. For the first 4 months of this year my body felt awful in training leaving me 6 weeks to really put in all the work. In those final 6 weeks I refocused on appreciating the ability to feel good again and trusted my training. I listened to my body and did my best to stay the course. I got to a point where I felt confident with 6:10 pace, but only race day itself would tell me if the work I was able to fit in would be enough to run an OTQ. The Raleigh heat and humidity certainly didn't help make up for lost time. Coach, Steph Bruce, helped keep me focused on the task at hand and assured me that I would be good to go on race day. I held on through 20 miles when our 2:45 pack broke up. That pack was the reason I held it together when my legs started feeling the hurt early around mieles 15-16. When we went through the first mile, a pack had formed. 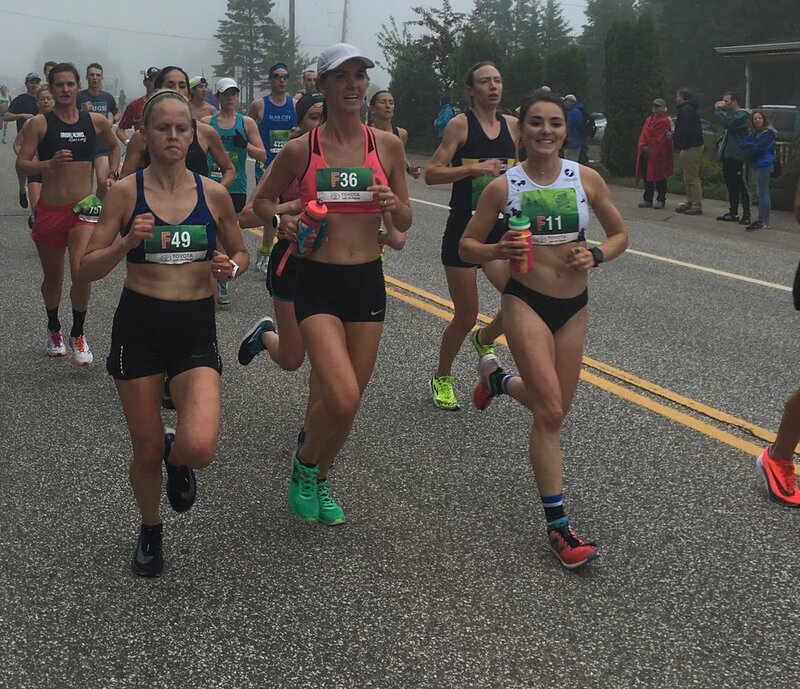 A pack of women looking to go sub 2:45. The next 19 miles were like nothing I have ever experienced. Bottles were being passed around, pacing duties rotated as the winds changed, and when someone needed help, help was given. It was like a Desi waiting for Shalane at the Boston Marathon. I couldn't help but be inspired by these women and I wanted nothing more than to hang in there. It was also a perfect example of the rise of American distance running. It's been a year and a half now since I have run where I know I am capable of but this past weekend was just a sign that I am on my way back. At mile 24 I came around a corner to music blasting Fight Song. The same song I put on repeat in the months following the 2016 Olympic Trials. The timing of it just felt like a higher power. Being able to run what I did after the season I had makes me excited to get back to it. The moment I crossed the line I was already thinking, what's next? So, after some down time I'll be going back to Indy Monumental to chase my OTQ. And I can't wait.